I entertained high hopes for this concert. Sadly, many, though by no means all, remained unfulfilled. Londoners are spoilt when it comes to Berlioz, but it would be a pity if the presence of Sir Colin Davis scared off all challengers. It does not seem to do so, which is all well and good, but Sir Mark Elder’s account of the overture to Benvenuto Cellini disappointed. Opening rhythms were sharply defined but the music was simply too hard-driven, a problem exacerbated by a lack of orchestral balance, the brass often drowning out or at least unduly subduing the strings. Then came a very slow section, the contrast being overdone, to put it mildly. Berlioz is fully able to withstand – indeed, it might well be argued that he invites – a less Classical approach than that of Davis, but the stop-start, sectional nature of at least the first half of this performance dragged him down to the level of the Italian repertoire he so despised. I had the impression that Elder had Verdi in mind, a comparison that might please many, but not me. Nevertheless, during the slower passages, the strings of the Hallé – when did it stop being the Hallé Orchestra? – sounded unusually rich for an English orchestra. Once Elder had settled down a bit, there was an impressive command of line to be heard, but it was too late. This performance did not add up to more than the sum of his parts; I cannot imagine that it would have converted any of the still numerous Berlioz sceptics out there. La mort de Cléopâtre was another matter altogether and could be accounted an unqualified success. The presence of Susan Graham certainly helped. By turns imperious, deranged, wistful, and devastated, her effortless command, both of the French text – almost if not quite always audible – and of Berlioz’s tricky vocal lines ensured that one truly understood and experienced the fate of that most alluring and tragic of heroines. That Cleopatra was the last of her line, the shame she therefore felt at her actions, could hardly have been more palpable, likewise the inexorability of fate. A similar figure, Cassandre from Les Troyens, beckoned as life ebbed away in the final stanza. But here, as elsewhere, the orchestra was an equal partner in the tragedy, the desolation of the final few bars truly worthy of the life and line extinguished. Such had been apparent from the very opening, in which orchestral turbulence plunged us in medias res. Thereafter, the alertness of the Hallé’s and Elder’s response to Graham was impeccable. The crucial transformation of atmosphere at the opening of the Méditation was established forthwith, from the pizzicato strings and funereal trombones. Later, plangent woodwind joined the ominous triple-time rhythmic tread. Fate could not be stopped; nor, so captivated had one become, did one wish it to be. Mendelssohn’s second symphony, the Lobgesang, has not been blessed at the Proms. According to the programme, it was last performed forty years ago, by Rudolph Schwarz and the Philharmonia, and before that, one had to go back to the turn of the century for no fewer than three performances under Sir Henry Wood. Fashions change, of course, and this is a work that lends itself to be tainted with suspicions of Victorianism. I sensed an eagerness on Elder’s part to dispel such suspicions; however, I was far less convinced by the way he went about it. I told Mendelssohn that I believed I had convinced ... [the conductor that he should] take the tempo slower than usual. Mendelssohn perfectly agreed with me. We listened. The third movement began and I was horrified to hear precisely the same old Ländler tempo; but before I could voice my annoyance, Mendelssohn smiled and pleasantly nodded his head ... I thought myself standing before an abyss of superficiality, a veritable void. Wagner was quite right about the tempo of that minuet, though modern practice has largely disowned his advice. However – and this, I realise, might be considered a controversial twist – a better way to absolve Mendelssohn of unfair (Wagnerian or otherwise) accusations of superficiality than aping Mendelssohn’s own preferences or manners, even if it were possible to establish them, might be to hear a little more Wagner in Mendelssohn. Flexibility of tempo, a sense of drama and occasion: these go a long way to rescue the composer both from hidebound Victorian pieties and from superficialities either of the composer’s own time or ours. Karajan understood this, at least instinctively, and recorded a truly commanding version of this symphony. I could not help but wish that Elder’s reading had resembled that recording, or at least that of Claudio Abbado, a little more. For there clearly was something of an ‘authenticist’ agenda at work here, and not just in the tempi. The strings – with one notable exception later on – were permitted vibrato, but very short bow strokes were the order of the day. One definite advantage was splitting of the violins, however, permitting one to hear fully the delightful antiphonal exchanges between the two violin parts. Nevertheless, and despite the large orchestra, an apparent ‘lightness’ was insisted upon, akin to that which is often, misguidedly, inflicted nowadays upon another ‘early Romantic’, Schumann. Both composers end up sounding short-breathed and foursquare. (Perhaps this is partly what was going on in the Berlioz overture, though certainly not in La mort de Cléopâtre.) The Allegretto un poco agitato was graceful within its short-breathed confines, but again did not help Mendelssohn escape accusations of elegant superficiality. Woodwind solos, however, were ravishing: straight out of A Midsummer Night’s Dream. The Adagio religioso was taken at quite a flowing pace, yet it sounded pleasingly unaffected, like a Song Without Words. Again, the woodwind provided additional pleasure, but the strings seemed uncertain whether to opt for Romantic warmth or ‘period’ inhibition. With the advent of the chorus – or rather, choruses – matters improved considerably. I have nothing but praise for the Hallé Choir and Hallé Youth Choir, both clearly impeccably trained by their chorus masters, James Burton and Gregory Batsleer. A full yet clear choral sound announced itself from the very first entry. The clarity of the counterpoint made Mendelssohn, quite rightly, sound more Bachian than is often the case, and yet with no sacrifice to weight of tone. Orchestral mannerisms were less apparent, though not less present, during the choral movements. It was also a delight to hear a full contribution, here and elsewhere, from the organ. In the chorus, ‘Sagt es, die ihr erlöset seid,’ the choral singing was nothing short of superlative: dramatically characterful in the fashion of the Bach Passions and Handel’s oratorios, and demonstrating triumphantly that large forces need not entail fusty piety. The a cappella first stanza of ‘Nun danket alle Gott’ – that echt-Lutheran chorale – approached perfection, every word and every note audible and meaningful, as if we were hearing an outsize College choir. Steve Davislim’s tenor contributions were generally of a high standard, especially in the flexible recitative – at last some flexibility! – of ‘Saget es, die ihr erlöst seid durch den Herrn’. The following passage, ‘Er zählet unsre Tränen,’ was also well sung but let down by gingerly treated orchestral parts. If only the Hallé’s musicians had been allowed to sing more. When, at last they were, in the second stanza of ‘Nun danket alle Gott,’ the effect was undeniably powerful – and moving. (I should, however, note an excellent horn solo in ‘Ich harrete des Herrn’.) I felt extremely sorry for Sally Matthews in her solo following the first chorus. Taken at an utterly breackneck speed – Mendelssohn marks it Molto più moderato ma con fuoco – she sounded and looked rushed, harassed even, which may help to explain some very odd vowel sounds. In that cruelly exposed solo turning-point, ‘Die Nacht ist vergangen,’ she was almost, but not quite, there in terms of intonation. (Having lauded Karajan’s recording, I should perhaps note that Edith Mathis is further away there.) During the extraordinary – indeed rather Wagnerian – tenor lead-up to this moment, Davislim was variable. A darker orchestral sound would have helped, but he also on occasion proved over-rhetorical, breaking up the musical line on the first call of ‘Hüter, ist die Nacht bald hin?’ (‘Watchman, will the night soon pass?’) Having said that, he improved upon its repetitions, bringing a sense of eagerness to the coming of the day: in this work, allied to the advent of the printed word. Elder continued, however, to provide jarring orchestral contributions, most notably of all in the horribly emaciated sound of the lower strings in ‘Drum sing’ ich mit meinem Liede’. It could have been a slightly augmented viol consort we heard. An exultant opening to the final chorus provided some compensation, but this was to an extent vitiated by the return to an excessively fast tempo for the final lines. I suppose he had to do so, since it is marked Maestoso come I, but the come I part of the instruction negated any sense of majesty. There were, then, good things in this performance but, like that of the Berlioz overture, there were many aspects that neither convinced on their own terms nor complemented each other. Haydn’s operas require no apologies. Rarely, if ever, do they show the composer at his very greatest; they fall short, especially in modern terms, when it comes to characterisation; and, of course, they are not written by Mozart. However, they are full of splendid music; without exception, they satisfy in formal terms; the comedies, this one by Goldoni no less, are excellent fun; and, quite frankly, they are superior to a considerable number of works considered far more central to the operatic repertoire. Armida received a landmark Salzburg Festival production in 2007, to be revived this summer. Il mondo della luna is perhaps a slighter work but a wonderful opera nevertheless. Here, marking the two hundredth anniversary of the composer’s death, the fortieth of the lunar landings, and the tenth of Opera East Productions itself, we were treated to rather a riotous commemoration. Jeff Clarke, quite astonishingly, was presenting his third production of Il mondo della luna. Great attention had clearly been paid to the characters, lending them greater ‘personality’ than libretto and music might in themselves suggest. Some might object, but I thought this a good thing. Elroy Ashmore’s costumes start off in what seems to be an increasingly fashionable vein: eighteenth-century with a modern, stylised twist, poised on occasion between surrealism and simply sending the whole thing up. Garsington’s recent Mirandolina – another Goldoni comedy – was similar in this respect. Once the old fool Buonafede has been persuaded that he has been taken to the moon, the costumes and designs become straightforwardly outrageous, likewise much of the acting. 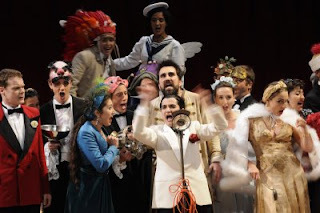 As an exercise in high camp meets slapstick, this was one of the funniest operatic performances I can recall, though some might think it all a little overdone. My only real objection lay with Clarke’s own translation. This goes beyond mere colloquialisation and becomes pointlessly crude, and indeed considerably remote from Goldoni. In any case, the sound of Italian suits Haydn’s music so much better. Colin Morris was an impressive, if bizarre Buonafede, better considered in Carry On acting terms than as a purely musical performance, though he did manage to impart the vocal impression of an elderly man without sounding inadequate. For me, the star of the show was Kate Flowers’s Lisetta. As ever in opera buffa, it is the servants who know best – as this Lisetta knew very well. Knowing but also invitingly warm of tone, I wished we had heard more from here. (The work was subjected to a good number of cuts and not only in the recitatives.) Alexander Anderson-Hall’s Cecco was the other, sharply-characterised servant, though I thought it a pity he had been instructed to sing in a Mockney accent throughout. It becomes wearing and cannot really be maintained. Still, that was hardly his fault, and he has a winning stage presence. Andy Morton and Håkan Vramsmo improved as time went along, in the roles of the bogus astronomer Ecclitico and his noble accomplice, Ernesto. 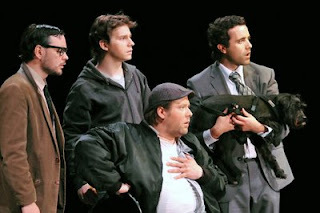 Where in the first act they had seemed a little stilted and vocally underpowered, their performances in the second and third acts were more impressive, more integrated into the company as a whole. The objects of their affection – Buonafede’s daughters, Flaminia and Clarice – were given good performances, sure in their phrasing and for the most part their coloratura, by Lara Martins and Katie Bird. Benjamin Bayl’s direction was flowing and stylish. Some tempo choices I might have quibbled at, but even when arguably erring on the fast side, Bayl withstood any temptation to the merely hard-driven – unfortunately all too common in contemporary performances of eighteenth-century music. He clearly delighted in the score and thereby enabled the audience to do so too. His continuo playing was sprightly and witty too. For the most part, the orchestra played well enough, though earlier on there were a few too many occasions of sour intonation from the leader, Philippa Mo. It is an exceptionally difficult task to play such music one-to-a-part, doubtless dictated by economic circumstances. However, what sounded very much like amplification – unless it were a very strange trick of the acoustic – did not help. The balance remained the same, solo strings remaining underpowered, whilst the sound became unreal. However, this was a performance in which – perhaps wisely, given relatively straitened circumstances – theatrical values took precedence over the purely musical, and those theatrical values often impressed. One does not expect Covent Garden on the Cam, but there was a great deal of enjoyment, musical too, to be had here. 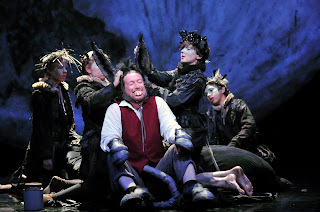 Opera East Productions certainly presented a far superior performance to the most recent occasion on which I had heard English Touring Opera, a higher profile but roughly comparable outfit. Oliver Gooch’s company deserves our encouragement and support. Greatness, by definition, manifests itself rarely, yet I find myself in the curious position of asking whether I have really heard two great performances of Mahler’s Ninth Symphony this year. Perhaps distance, temporal and critical, will disenchant, but I suspect not. Just six months after Daniele Gatti’s shattering account with the Royal Philharmonic Orchestra came a very different, yet at least as ‘great’ performance from the London Symphony Orchestra and Bernard Haitink. What a relief, moreover, it is to credit the LSO, showing that a truly dreadful – ‘extraordinary’ in more than one sense – rendition of the very same work, little more than a year ago, had nothing to do with the orchestra itself and everything to do with uncomprehending direction from Valery Gergiev. Indeed, in terms of orchestral execution, the present performance could not fail to consign the RPO, on good form though it was, to the relative shade. The first movement opened slowly, and continued that way, more world-weary than one might perhaps have expected, yet from the outset radiantly beautiful. An inexorable onward tread - I do not think I have ever heard Mahler’s harp sound so ominous – recalled the Schubert of Winterreise. This in turn reminded me of a recent observation from Michael Tilson Thomas, that ‘Mahler pursues Schubert’s goals with Wagner’s technique’. Sure enough, virtuoso brass brought out echoes of Götterdämmerung and the timpani recalled the indelible impression Fafner clearly made upon Mahler. For, as with Wagner, the Mahlerian and especially late-Mahlerian dialectic between beauty and ugliness suggests, as did this performance, that the latter might enhance rather than detract from the former. Haitink did not exaggerate in his evocation of the dark side of the orchestral moon, yet he knew precisely where to highlight not only the discordant but also the shocking in timbre. During moments of apparent calm – anything but, in retrospect – we appeared to stare straight into the abyss. Divert one’s eyes or ears though one might wish, so compelling was this performance that such was not an option. The closing horn calls of consolation – but are they? – resounded as if from the dawn of German Romanticism, yet with a knowledge that even relative innocence could no longer pertain. Gareth Davies’s flute solo quite rightly suggested something more fragmentary, modernistic, whilst other attempts at completion, not least that of leader Gordan Nikolitch, simply could not square the circle. This despite, or even partly on account of, the latter’s sweetness of tone. The rusticity with which the next movement opened cast another backward glance to the world of Der Freischütz, yet again acknowledged that such a world could no longer be. For all the buoyancy of Mahler’s Ländler rhythms, there was something hollowed out to their expression. The composer’s ghostly counterpoint attempted to fill the gap, yet necessarily fell short, despite a busy quality that recalled the Fifth Symphony in particular. Such failure was not so stark as one might hear in a reading from Boulez, yet it nevertheless remained clear. The oases of ‘calm’ once again struck terror into one’s heart; clear-eyed in their depiction, there was no need for shrieking shock tactics. And when the marionettes came out to play, they terrified too. Such play was, however, a mere presentiment for the Totentanz of the Rondo-Burleske. Again, Haitink’s absolute rhythmic surety provided a sure foundation for the horrors to come. The conductor proved equally adept at reminding one not only of the connections with the previous movements, but also with the way Mahler now pushes further whatever had already seemed extreme. Thus sepulchral brass once again evoked Wagnerian twilight. We also heard echoes turned bad of the Fifth and Seventh Symphonies’ counterpoint: Die Meistersinger without Gemeinschaft, the twentieth-century nightmare. Just when all might have turned too sour, there was required a vision of what might be – or what might have been. Yet even that would soon be cruelly distorted, all the more cruelly for retaining so much of its initial fleeting beauty. Those vistas, physical and metaphysical, of whose evocation Mahler is so supreme a master, come no more ravishingly spell-binding than in this turn from A minor to D major. However, magical harp glissandi that needed to be heard to be believed cautioned one to remain equivocal: the view is agonising in both its proximity and its distance. And so it was that the marionettes of death must return, fairly mocking us in their exultant triumph, cosmic Norn chatter turned acidic. Yet, if such mockery remains chatter, we can retain hope, vindicated by the dawn – or should it be twilight? – of the Adagio. This was a warm account, the LSO’s strings beguiling both in their vibrato and their occasional use of portamento. One recalled the final movement of the Third Symphony, albeit whilst recognising that much has changed since then, as Mahler’s ghostly interruptions reminded us. Counterpoint was now reconciled with harmony, as if the movement were a giant Bach chorale prelude. Perhaps, in some senses, it is. Although there would be instances after Mahler when an orchestral string section could once again sing together, perhaps even occasional instances without irony, one nevertheless felt that here was the end of a line. Haitink imparted, crucially, both a sense of loss and a sense of resolve. Debating whether this movement, or indeed the symphony, is ‘about’ life or death misses the point; how can one consider the one without the other? Bach knew that – and so should we. Thus, we arrived somewhere, even if it were uncertain where; progressive tonality can have that effect. This was a destination and a new beginning, though one could never forget what had happened before; true reconciliation is not amnesia. In both work and performance, something had subsided, yet some possibility had opened up before our ears. Götterdämmerung would have been a struggle to put on in the courtyard of Aix’s archepiscopal palace. Torchlight procession echoes of the Eumenides notwithstanding, it was doubtless wise to reserve Wagner’s drama for the splendid new Grand Théâtre de Provence. The Théâtre de l’Archevêché remains, however, the traditional heart of the festival, and it was here, as dusk fell, that I saw and heard my final performance, a satyr play almost, from this year’s programme. 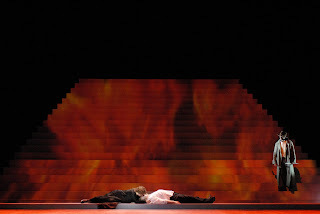 Orphée aux enfers does not have much in common with Götterdämmerung, although both came under the umbrella of the festival heading, opera and myth. This was really too general a heading to be of value – the Orpheus myth itself might have been more manageable, whilst still offering a plethora of choices – but no matter. Offenbach’s opéra bouffe provided an enjoyable contrast. The production, for the Aix Festival and the Académie européene de musique, subsequently transferring to co-production partners in Toulon and Dijon, had its problems. Yves Beaunesne seemed unable to decide what he was trying to accomplish. According to an interview in the programme booklet, he sees Offenbach as having had two targets in mind for his satire: political and social matters on the one hand and myth on the other. Beaunesne then makes the questionable assertion that, ‘in order to find once again the original radicalism’ of the work, one should invert the proportions of the original targets, concentrating on political and social satire, since ‘mythology no longer belongs to our [frame of] references’. Perhaps not to his, though he might be wiser only to speak for himself in that respect. More importantly, this claim, whether accurate or otherwise, does not seem to be carried through into what we witness on stage. In the first scene, which, like the rest of the production, seems to be set vaguely in the 1920s, mythology seems barely present. Orpheus and Eurydice are just a musician and his wife, though, given the downplaying of the satire on myth, there does not seem to be anything amusing about this. Thereafter, however, we seem to be vaguely in the world of myth, albeit in vaguely 1920s guise. None of this is of supreme importance, but I cannot understand what is gained. Had the proposition been that updating to the present was necessary, it might have been incomprehensible, but an interwar setting does not seem especially more relevant to the early twenty-first century than a production set at the time of composition, or indeed at almost any other time. A case, of course, might have been made, but I am not sure that it was. 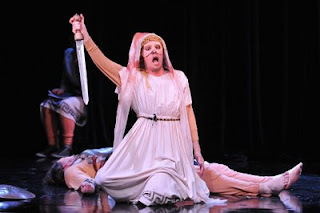 What we had, instead, were some intermittently pretty sets and some splendid costumes (Patrice Cauchetier) and a few puzzling interpolations, such as Pluto, in his initial guise as Aristaeus, arriving upon stage on roller-skates – handled with great aplomb, I might add. Insofar as I could trace an idea, it seemed to be that Eurydice was a social climber, seduced by a picture of a film star (? ), who whisked her off; she became bored and ended up being whisked off by someone (Jupiter) more influential. The problem was less the idea than that it was weakly presented. The gods’ banquet in the second scene – this was the original, two-act version, with some additions from 1874 – seemed just a bit old-fashioned, redolent yet not emphatically so of the Second Empire, whereas I had imagined we might have had a real taste of Hollywood. Public Opinion, after all, seemed to be a busybody reporter, forever taking photographs. Enjoyable – yes; coherent – no. Alain Altinoglu, however, provided a fizzing account of the score, for which much praise should also be given to the Camerata Salzburg. Hardly their core repertoire, one would have thought, but Altinoglu’s direction provided drive and tenderness, though never deathly sentimentality, and a welcome opportunity to hear the ample soloistic opportunities Offenbach grants various instruments. Chief of these, of course, is Orpheus’s violin, in the hands of the excellent leader, Roman Simovic, but there are many more, all of which were well taken here. The young cast, drawn from the ranks of the Académie européene de musique, generally made the most of its opportunities too. Chief amongst them must surely be ranked Mathias Vidal’s Pluto, sweet of tone in a classically French manner, and a good actor too. Francis Bouyer attracted a somewhat lukewarm reception as Jupiter, but I thought him rather good too, with a fine swagger, both vocal and visual, though he seemed to tire a little during the second act. Julien Behr’s Orpheus was sweetly sung and convincingly portrayed. Pauline Courtin generally handled well the demands of her part as Eurydice, albeit not without a certain tendency for her voice to harden during vocal display. I was enchanted by Emmanuelle de Negri’s splendidly boyish Cupid, whilst Jérôme Billy did an excellent job as John Styx, though he was not at all assisted by the production, which, under the guise of amusement, really made the character outstay his welcome. The smaller parts were also generally well taken, not least in terms of stage presence. I do not doubt that we shall be hearing from some of these singers again. Pierre-Laurent Aimard, Pierre Boulez, and the Berlin Philharmonic in a programme of twentieth-century orchestral masterpieces: how could it fail? Of course, it could not, for this proved an outstanding concert in every respect. Bartok’s Music for strings, percussion, and celesta opened the programme. The viola opening sounded icy, frozen opening, with an utter inevitability in the build up to the climax of this opening fugal movement. Everything stood perfectly in proportion, thereby heightening the emotional import of the music, just as in Bach (everything, that is, except a watch alarm). Eerie beauty was enhanced by an excellent rendition of the celesta part. The return to freezing point, albeit from the first violins, was equally impressive, truly conveying the perfection of Bartók’s form. Division of the violins to right and left of the conductor – an unusual seating arrangement for Boulez, not continued in the second half – gave a true sense of answering back and forth in the ensuing Adagio. Precision of rhythm was absolute, again heightening rather than detracting from – as some might have it – the music’s expressive content. That applied to all of the musicians, though the piano part was perhaps especially noteworthy in this respect. A great mass of string tone, whether bowed or plucked, helped here too, without loss to exactitude. In Bartók’s almost Mozartian profusion of melody every line is – and was here – essential. Boulez’s reading was febrile but controlled: a perfect marriage. He and the Berlin players showed that the opening of the third movement can still sound weird, without resort to mere freakishness. Bartók’s trademark ‘night music’ benefited from chilling yet magical sonorities and, once again, absolute precision. The spatial element of the music was throughout readily apparent. Rhythm and melody came together in perfect harmony, as it were, for the finale, which also reminded us of the yearning quality in so much of this composer’s music. It is a while before one hears the soloist in Ravel’s left-hand concerto. The orchestral introduction truly sounded as if it emerged de profundis, characterised by a grim determination unusual in Ravel’s œuvre. The upward swell thereafter was magnificent. Aimard’s response was implacable, marrying strength and clarity. One heard a degree of effort, which is written into the score, but one could also more or less imagine, as Ravel desired, that the soloist’s part should sound as if it were being played with two hands – and two expert hands at that. The ‘impressionist’ label has never suited Ravel, whose clearness of purpose is often diametrically opposed to the vagueness of much of Debussy, but here it should surely have been lain to rest. One could luxuriate in the piano and orchestral harmonies without a hint of indulgence; once again, command of structure was absolute. The same implacability and strength of rhythm characterised the second of the concerto’s two movements. We heard warm, yet sharply-etched, ‘Chinese’ character, recalling Ma mère l’oye, followed by mesmerising, Lisztian solo figuration, prior to the inexorability of the climax. Daphnis et Chloé met the blues. But there was equally dazzling success to be heard in the account from Boulez and the BPO. The first piece’s sonority resembled magnified Ravel, at least in the context of this programme. It seemed to me what Boulez has said about the ever-expanding implications and limits of serial technique might be applied to orchestral colour too. Nevertheless, there was a relative restraint, especially when considered in relation to some of the subsequent movements. The seventh, placed second, was beguiling, languorous, luxuriant: had a hint of Messiaen made its way into work and performance? In the expansiveness of this reading, this was unquestionably ‘late’ Boulez, redolent of the magic of sur Incises. In the fourth Notation, the orchestration was made to sound – as it is – worthy of, if unrecognisable to, Ravel. The Berlin percussion truly had a chance, superlatively taken, to shine here. Number three made me realise how Boulez, having once written for his own instrument, the piano, was now writing for his own instrument, the orchestra, the transformation owed to decades of conducting experience. The writing sounded almost hyper-Romantic – that magnification and expansion of possibilities again – which is not at all the same thing as the easy solution of neo-Romanticism. Finally, came the second Notation, a riot of precision. Every section of this great orchestra was tested and passed with flying colours. If there was perhaps not quite the abandon of Boulez’s LSO performance last year, it was a close run thing. As has become his practice, this final piece was encored. This was the best performance I have heard from Antonio Pappano at the Royal Opera House, or indeed anywhere else. I cannot bring myself to be wildly excited by nineteenth-century Italian opera – clearly unlike most of the audience – but this is clearly his thing and he would be well advised to concentrate upon this repertoire. Wagner, Beethoven, and Berg are avowedly not and he would be equally well advised to steer clear of them. The orchestra was on colourful, sprightly form, right from the beginning of the overture, and there was a clear sense of structure throughout. (How very unlike this conductor’s Wagner!) Whatever Rossini’s musical and dramatic limitations, his command of musical form, albeit in a somewhat old-fashioned way, is always apparent, a clear contrast with, for instance, Verdi. There are no depths to be plumbed here but there is a musical story to be old – and told it was. 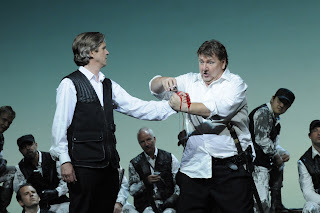 Moreover, Pappano was extremely fortunate in his cast, which could scarcely have been bettered. Joyce DiDonato proved a heroine in more than one sense. Injuring her leg at some point during the first act, she insisted upon carrying on, despite her pain – and her crutches. Singing of cramp in her foot caused much amusement all round. None of this, however, affected her pinpoint coloratura accuracy, nor as expressive a delivery as Rossini’s style allows: far better to be slightly distanced, which she was not, than to approach the mawkishness of the composer’s dubious successors. Juan Diego Flórez was equally astonishing in his despatch of the technically fiendish demands his part presents. He also showed himself to be a fine comic actor, never seeking the limelight, in spite of a disruptive audience reaction that owed more to the football stadium than to dramatic appreciation. Florez’s voice is not large but he marshals it extraordinarily well. I fell to wondering whether it might be heard to advantage in more satisfying repertoire. Perhaps certain, but only certain, Mozart roles? In any case, the question would appear redundant, since he seems quite happy to devote himself to Rossini and Donizetti. Pietro Spagnoli substituted for Simon Keenlyside. 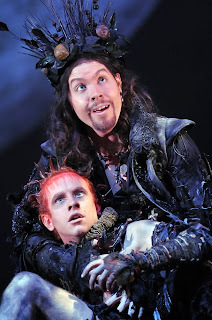 This Figaro had plenty of stage presence and a good command of musical character too. If not so dominant as might sometimes be the case, this was owed to the strength of ensemble rather than to any deficiency on Spagnoli’s part. 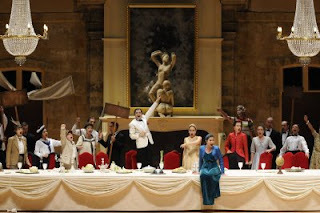 Speaking of ensemble, there was at least as much joy to be had from Alessandro Corbelli’s Bartolo and Ferruccio Furlanetto’s Basilio as anyone else. Their native command of Italian paid great dividends, in terms of the natural, unaffected quality of their comedy and verbal response. Jennifer Rhys-Davies proved an equally characterful, indeed rather lovable, Berta, although it seemed a pity that she was made to play her aria for laughs, when a degree of poignancy would have seemed more fitting. The Royal Opera Chorus was on excellent form too. I could not warm to Moshe Leiser and Patrice Caurier’s production, any more than I had the first time around. This, I suspect, is largely because it tries so very hard to be ‘heartwarming’, rather like those dreadful ‘romantic comedies’ that so plague modern British cinema, or, perhaps worse still, the Roberto Benigni film, La vita è bella. The latter’s treatment of its subject matter seems to me to border on the offensive. There is nothing by which to be offended here, but the bright, primary colours, the designs that resemble boxes of sweets and their contents, and the general tone of whimsy: for some of us grumpier souls, it is perhaps all a bit much. More seriously, Rossini’s formalism, the alienating quality his characters might be persuaded to take on, is shunned in favour of crowd-pleasing sentimentalism. Still, the musical performances were without exception of a very high standard.